What Can I Take to Reduce Cortisol in My Body to Help Lose Weight? Most people know that, if you eat more calories than your body needs, you'll gain weight. But you may not know that other biological factors play a role in weight gain, too. In particular, a hormone called cortisol is integral to weight gain, and too much cortisol can even make weight loss more difficult. If you're trying to lose weight, finding ways to reduce your body's cortisol level may help you drop excess pounds. MayoClinic.com explains that cortisol is the body's main stress hormone, released into your body when your brain perceives a situation as threatening. In theory, cortisol helps your body fight off or flee from danger; but in reality, most people don't face mortal danger in their daily lives. Even so, your body can misinterpret daily stressors as sources of true danger, and release cortisol into your bloodstream in response. According to MayoClinic.com, if your life remains constantly stressful, your stress response can "go haywire," leading to chronically elevated cortisol levels. While more research is needed, some evidence suggests that chronically elevated cortisol is related to weight gain. Columbia University explains that high cortisol levels can cause increased appetite, and also promotes excess fat storage in the abdominal area. According to the University of New Mexico Department of Exercise Science, cortisol encourages increased consumption of sugar and fat by influencing the hypothalamus, which controls appetite. Whatever its pathway, excessive cortisol puts you at risk for weight problems and even obesity. Given the purported relation between cortisol and weight gain, it's not surprising that a number of diet products are marketed as cortisol blockers or reducers. These products' manufacturers claim that, since too much cortisol leads to weight gain, blocking your body's production of this hormone will help you lose unwanted pounds. However, so far, scientific evaluation of these products has not confirmed the claims. Diet pills advertised as cortisol reducers do not seem to be effective at promoting weight loss, says MayoClinic.com. Some experts dispute the claim that heightened cortisol encourages weight gain. Katherine Zeratsky, R.D., L.D., of the Mayo Clinic, states that, not only do "cortisol-bocking" diet pills not work, the connection between cortisol and weight is a theory in need of additional study. At any rate, the only surefire way to lose weight is to follow a reduced-calorie diet while engaging in regular exercise. And if excessively-high cortisol is indeed implicated in weight problems, more effective ways to lower your cortisol include lifestyle changes for reducing stress. 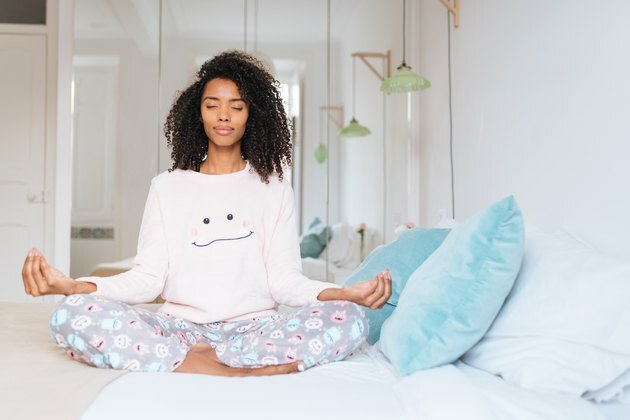 The University of California Irvine recommends yoga, meditation, breathing exercises, and muscle relaxation as some ways to decrease stress, and thus your cortisol level. Will Estrogen Help My Big Belly? What Are the Benefits of Cortisol? Is it Possible to Lose Weight With High TSH Level? What Kind of Exercise Reduces Cortisol Levels?